A recruiter is a man. A man is an animal. Therefore, a recruiter is an animal. STRANGE expert from another planet, The Recruiting Animal came to earth with recruiting abilities far beyond those of mortal men. 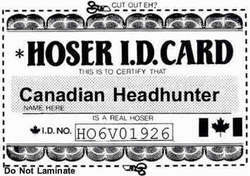 Co-Founder of the Canadian Headhunter blog, then a partner in the standard-bearing Recruiting.com, he is now founder of The Recruiting Animal and the co-author of two books in progress: Don't Call Us We'll Call You: A Job-Hunting Guide For the Mediocre and Downsized and Out-Placed on the Streets of Toronto: a Survival Guide for the Victims of Creative Destruction". RT reports on the antics of the hottest new recruiting personalities to celebrate their victories and, occasionally, administer a little Recruiting Justice. How did it come about? "I was watching Access Hollywood one night and I said to myself, I can do that. It was a gift." he claims, "I didn't have to do any thinking at all." RT is the only place you will find up to the minute reports on characters like: Shally Elvis Steckerl, The Funny Banker, Frankie-Goes-To-China, the Jasons, Venus de Micro, the Dog Lady, The Roti King, Laurence Larry Haughton, the Samurai Thai, Ami G, Vin Dieselevy and many, many, more. Before you contact The Recruiting Animal, please note that he works primarily in the Greater Toronto Area and knows nothing about immigration. And, although he is certainly one swell guy, if you send him your resume, chances are good that it will not relate to any of the positions he is currently trying to fill. So, here is some Immigration Advice. And here is a great book on job-hunting. And, you can find The Recruiting Animal's new group blog here. Fans, Shannon Seery and Julian Gude at Exceler8ion have given me an official Canadian ID card. Thanks, you two. Early adopters, hard at work with their new toys, rarely see the long term value in the tools. There's a kind of narcissistic power that comes from riding the latest technology for your allotted fifteen minutes of fame. Sadly, most of the early users are more like Icarus and burn out long before the real adventure begins. (If you haven't had a chance, take a look at the Recruiting Animal tirade on this subject (here's the related radio show). Animal's view is nearly as narrow as the folks he's busy critiquing. He claims on his blog, with some small justification and some greater irony, that blogging has made an insignificant dent in the Recruiting Industry. On the last day of my "Writing for Public Relations" class at UNLV, I mentioned to my public relations students that I would be a future guest on an online talk radio show. They seemed very excited by the prospect and several of them asked for a time and date. "But wait," I said, "I haven't even told you whose online radio show... it's ... are you ready ... it's The Recruiting Animal Shooowww!" Their enthusiastic expressions quickly turned to looks of sheer terror and inexplicable horror. Surely, their instructor had not lost all his marbles and taken to open discussions with someone who bills himself as "neither man nor wolf." "Don't do it!" they warned. I think that so many recruiters blog because they know that it helps them get jobs. Granted, some of the more inflammatory blogs actually might hurt peoples' chances of finding work at certain companies - not to pick on anyone, but The Recruiting Animal comes to mind, although it could be argued that even the Animal gets some gigs or splits out of his efforts. Or maybe he's just completely insane... who knows? There’s an unfortunate blogging subculture that prizes contempt, put-downs and facile dismissal over the hard work of engaging with ideas. While political blogging is particularly notorious, you’ll find that subculture’s influence pretty much across the board. It gets old very, very quickly, and it keeps a lot of people from joining the blogging world, because it’s a huge self-indulgent turn-off. While I eat my lunch at my desk, I often listen to Podcasts on recruiting. Unfortunately, not many Recruiting Podcasts are worth listening to because they are boring. I don’t know if it’s the voice inflection, tone or pitch, but I have hard time staying interested in the topics. However, there is a Podcast that I will recommend and that is Recruiting Animal's Podcast. He is not boring. He does a good job of trying to be entertaining while talking about the recruiting industry. The only complaint I have about Recruiting Animal’s Podcast is that he shouts too much. If you tuned in to listen to Michael in his customary fashion promote his own shallow agenda at the expense of his so-called friends, enjoy the show! I won't listen to it or tune in again. I don't have the time to waste. I don't know if they are going to have naked strippers in there or anything like that but as far as not knowing what's going to be said next and how and why and all those other kind of things... let me just stop and play you a clip from the first episode and you'll see. I have always connected with everyone, until now. There's no way I'll connect with "Recruiting Animal"... Come on, let's have a little professionalism here. This is your chance to archive/remove your invitation. Dave, I listened to most of the blog / radio show link you sent me yesterday and I have to say, the reactions and statements on European recruitment (in particular from the host) made my blood boil and made me very sad to be an American. The overwhelming generalisations of the recruitment landscape here were appalling.... It's things like these that continue to precipitate why Europeans get frustrated with the American egos. I listen to the Recruiting Animal. He rips on me all the time in his blog. And he rips on people I publish. But The Recruiting Animal is smart (and funny) and I have always known that he understands me even as he makes fun of me. RecruitingBlogs.com recently published the results of its annual readers' ratings of recruitment blogs, sponsored by ZoomInfo. Here are the winners of that contest in 10 categories, and I urge you to take a look at each one of them. They all follow the rules for an effective blog that I outline below. 1. Overall Recruiting: Six Degrees From Dave. 2. Recruiting Blogosphere: Recruiting Animal. 3. Third-Party Recruiting: Hiring Revolution. 4. Best Recruiting Technology: I, Donato. 5. Job Hunting: Wired & Hired. 6. Corporate Recruiting: WirelessJobs.com. 7. Sourcing/Research: CyberSleuthing. 8. Group: Xtra Cheezhead. 9. Recruiting Industry: Six Degrees From Dave. 10. HR: Gautam Ghosh. (The Recruiting Animal chats with the winners here). The Recruiting Animal is one of the foremost thought leaders of his generation. The proof? He made it into the Globe and Mail twice is one week! And they didn't come knocking on his door for nothing. He had something upstairs that they wanted. First, he was quoted on anarchists with day jobs. Then, he was quoted in an article on career blogs. "Most people can't write resumes; how are they going to write a blog?" he asks. Tom Frink is a wily old retiree who can't get enough of the blogs. "I used to be a ham-radio fanatic," he says. "And blogs are the ham radios of the present day. Every lonely loner who doesn't have the guts to face people directly can spout off like there's no tomorrow." Frink loves to criticize resumes. "If you like criticizing people," says Thomas, "there's plenty of meat in these woods." G Lord-Ketchup is a high school student in Toronto. In his spare time he likes to study interview techniques. "It's not what you know, it's how you say it." claims the talented teen. No actual relation to the opinionated guru, John Sumser Jr hopes to emulate his idol's ability to deflate recruiters who over-reach.